And it’s official. Here’s a gameplay clip of Heist on Riptide courtesy of YouTuber JackFrags. We’ll post more info as they become available. While Battlefield games are known for their realism, fans have been clamoring for dinosaurs in the game ever since a mock up image for Battlefield 3 was posted online. Well, it seems that Visceral Games is giving fans what they want in Battlefield Hardline. Just recently, EA invited a bunch of YouTubers to play Hardline in its San Francisco office, and the embargo is set to be lifted at 12 noon ET today. 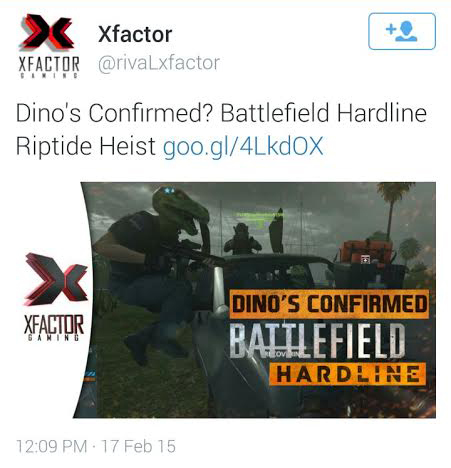 One of the YouTubers invited was XFactor, who tweeted an image of in-game characters wearing dinosaur masks. While the tweet has since been deleted due to not following the agreed upon embargo time, we’ve managed to grab a screenshot of it, which you can see below. For now, we’re uncertain whether there will be a full-fledged dino mode in Hardline, or if it will just be dino masks and other cosmetic items. Once the embargo lifts, we’ll let you know as to what extent Visceral’s fan service is. Are you excited that dinosaurs will finally be in a Battlefield game? Would you want a full fledged dino mode or will it do more harm than good to the franchise?